Philadelphia means ‘brotherly love’ and of all the letters of Jesus to His church I love this the most. It contains loving promises for both the church and the individual believer. 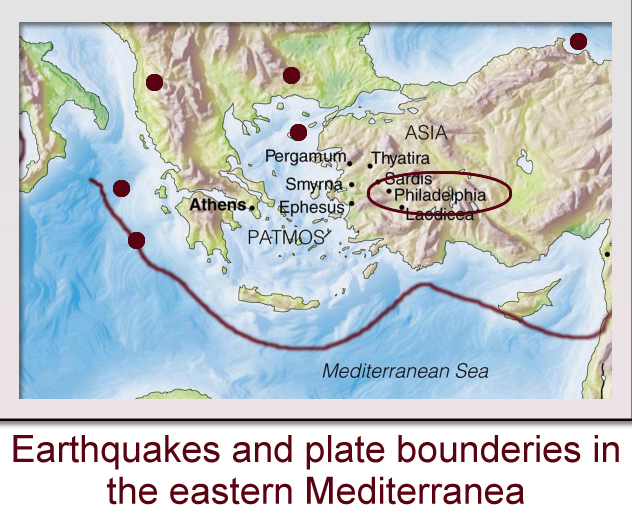 The city of Philadelphia was in an earthquake zone and so the assurance that Jesus would make those who overcome ‘a pillar in the temple of my God’ would have been particularly appreciated by the believers of that day. During earthquakes pillars and walls would often crumble and fall, and the inhabitants would have to flee the city and sleep out in the open country until the danger had passed. Jesus alludes to this when He writes, ‘never again will you leave it (the Temple)’. The promise is that if we obey and stay faithful to Him then we will be secure within His ‘temple’, the place of His presence. The letter starts with a reference to the ‘key of David’ followed by the wonderful words, ‘What he opens, no one can shut; and what he shuts no one can open’. David, as king of Israel had the keys to the city in both a literal and a metaphorical sense. Jesus, the descendant of David in his earthly lineage has the ‘keys’ to EVERYTHING! The doors He opens before us, only He can open, and nothing can shut them. There may be delays and interferences but the ‘doors’ will stay open – we just need to walk through them. However, I must qualify what I understand by an ‘open door’. I don’t believe that Jesus is saying that He will underwrite whatever we decide to do. So often we seek our own opportunities and even kick down doors that are closed before us. There is nothing wrong with this as making decisions and persevering in executing them is part of growing into maturity. Of course, in these cases we need always to prayerfully submit our decisions and strategies to God and, as importantly, not ‘deny His name’ in the way we go about executing our plans. The open doors Jesus guarantees to keep open are the ones He opens before us in the first place. In my experience, and in my understanding of biblical precedents, when Jesus opens a door of opportunity before us He communicates this in many ways and we become convinced and convicted that it is indeed He who is at work in our lives. The words that come just after this wonderful promise are even more precious to me: “I know that you have little strength, yet you have kept my word and have not denied my name’. The older I get the more aware I become that I am severely limited in what I can achieve. I can develop my skills and use my abilities to their fullest but at my best I cannot change a person’s heart, heal a broken body, or create something from what isn’t already there. Only God can do this, and if I want to be truly effective in this life then I need to rely on Him and trust Him for real results. When my children were young I taught them the adage, ‘Try your best and trust God for the rest’ and I realise more and more that in this is simple yet profound truth. If you want to get the full impact of this wonderful letter from the Lord Jesus then carefully read Revelation 3:7-13 several times and pay special attention to what follows the words “I know”, “I have”, “I will”, and “I am”. My next post in this series will draw from the last letter to the churches of Revelation, the church of Laodicea’. After that I plan to summaries the contents of Chapters Two and Three before starting to unpack part Two of Revelation, which starts at the beginning of Chapter Four. What is revealed there will surprise and delight many of you!